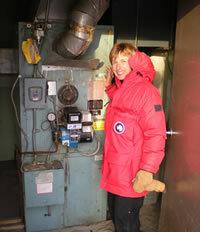 Carol worked as a utility technician at Antarctica's McMurdo Station. That means that she spent most of her time as a heating mechanic. It was a dream job. Days consisted of walking a route from building to building checking furnaces. The sun shone nearly every day and the air was some of the cleanest on Earth. Temperatures ranged from a low of -10º F (no worse than Minneapolis in January), up to above freezing around New Years. In addition to being checked on daily rounds, each piece of heating equipment had to be completely torn down and inspected annually. Heating is fueled by jet fuel—so that it doesn't gel in the cold winters. Everyone whose work can take them outside the station must go through outdoor survival training, called Happy Camper. Carol says that if she'd known that, she might not have taken the job. Happy Camper turned out to be spending a day and night in a small group out on the ice. Supplies were ordinary nylon tents and sleeping bags, tiny gas stoves, a few cooking pots, and dehydrated rations. Figure out how to light the stove and you can melt ice into water. There is a 56-hour work week, but sometimes there's an excursion outside the station. The penguin picture below was taken in the middle of the night. There is full sunlight around the clock in the summer. 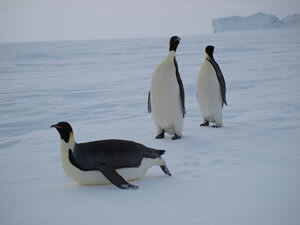 You can see more of Antarctica, including frozen ocean divers, at Carol's blog: carolfey.blogspot.com. 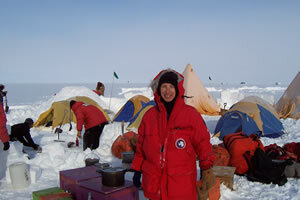 Carol has published a number of articles about work in Antarctica.